A unit price is sometimes called a unit cost. In either case, remember that it is customary to write the dollar amount in the numerator. In Example 3, be sure to notice two things. To compare unit prices, you should write each unit price using the same units. To convert dollars per gallon to dollars per fluid ounce, multiply by a conversion factor. When devastation hit Atlanta after Hurricane Katrina, Tide implemented their Loads of Hope campaign to assist families in having clean clothes. Tide has since taken their traveling laundromats to many other locations. For more information and to see how your purchase helps the program, visit Tide Loads of Hope. If you'd like to donate or volunteer to help after a disaster strikes, visit the American Red Cross. 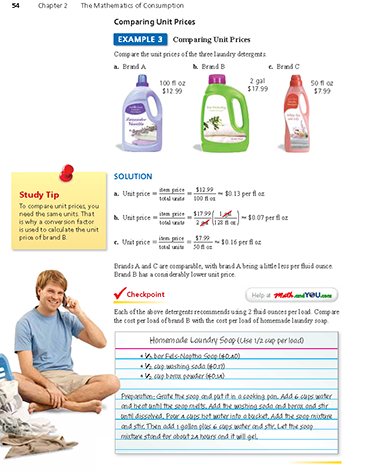 Each of the detergents in Example 3 recommends 2 fluid ounces for a load of wash. The cost per load is as follows. For the homemade laundry soap, use 1 gallon = 16 cups to figure out the amount of soap produced in one batch. Each load of laundry needs cup of soap. So, the cost per load is roughly $0.01. The comparison is amazing, isn't it? These comments are not screened before publication. Constructive debate about the information on this page is welcome, but personal attacks are not. Please do not post comments that are commercial in nature or that violate copyright. Comments that we regard as obscene, defamatory, or intended to incite violence will be removed. If you find a comment offensive, you may flag it. The next time you're at the grocery store you should check out the price label for some of your favorite foods. Most stores will list the unit price on the price label so that you can compare the price per ounce of different brands. "A penny spar'd is twice got." The idea was that, by declining to spend a penny and to save one's money instead, you are a penny up rather than a penny down, hence 'twice got'. ©Larson Texts, Inc. All Rights Reserved.